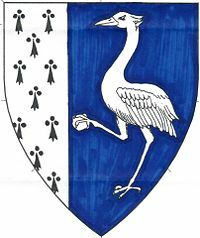 Azure, a crane it its vigilance argent and a tierce ermine. 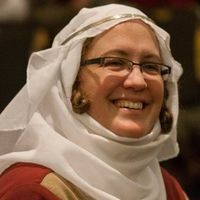 Baroness Christiana Crane, found the SCA in college when Endewearde was still a shire. After an extended pilgrimage into the "real" world, she returned in 2012. She now resides in Malagentia. Christiana Crane was born July 28, 1315 in York. The daughter of a successful and well respected merchant, her family was mercifully spared from desperate hardship during the Great Famine. Many years later, her family undertook a pilgrimage to the Cathedral of Santiago de Compostela to give thanks for their many fortunes. Sadly, her family succumbed to the various hazards of the road, leaving her to seek sanctuary with Lord and Lady Fulton. As a member of their household, Christiana has had the pleasure of meeting many new people from all points of the globe, and experiencing their exotic ways. Adding information to the EK Wiki, particularly to assist in the record keeping of the royals of the East. In the event that Christiana cannot make a Royal summons, she would be delighted to have Their Excellencies Endewearde deliver any messages from Their Majesties. She likes surprises, but knows that surprises are very hard to keep from her. This page was last edited on 21 August 2018, at 11:25.